Sometimes it’s hard to get to sleep with all the distracting sources of light out there. If your neighbor has outside lights or someone in your house needs a light on, it can be hard to block out. A sleep mask helps you get to sleep without inconveniencing anybody else by blocking the light where you need it most–around your eyes. When crocheting, make sure your stitches are nice and dense to get the most out of your mask. Repeat rows 2 and 3, 12 more times until there are 27 rows. Arrange the two circles so that the opening of the first one fits into the opening of the second one. Sew the circles together where the openings meet. Sew the elastic to the wrong side of the strap. Sew the strap to the mask. 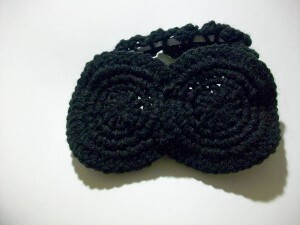 This entry was posted on Thursday, November 3rd, 2011 at 1:08 PM by Candace	and is filed under Free Crochet Patterns. You can follow any responses to this entry through the RSS 2.0 feed. You can leave a response, or trackback from your own site. This sounds very try-able, if that’s a word. Tell me though, could one sew some cloth under the circles for extra darkness / comfort? If so, how would you do it? Dana, I’m sure you could, but that would be a whole other tutorial. Dana, i think you could. Just loosely trace the two sewn-together circles, trim the fabric, and sew it to the edges of the crocheted circles. If you don’t like the finish, use some silk ribbon and sew it around the edges. Thanks for the pattern, Candace! How did you know this was next on my list to crochet? Thanks Candace. I was wonder what crochet hook was used for the circles,g or i? I honestly don’t remember. I probably used G for a tighter gauge. try making two mask parts, I would then cut cross stitch material to fit inbetween more than one layer, that will make it more shapeable and darker at the same time, I did this recently for a mini mouse doll, they said to use wire in the ears, it is for my grand daughter and with my grandson being 2 it seemed wiser not to put the wire. I loved how it worked out.